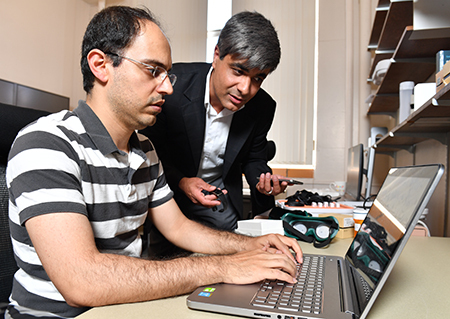 Hassan Ghasemzadeh, right, holds a smartshoe that can be used to monitor a human gait using sensor data, as student Marjan Nourollahi sees how tunnel vision goggles can simulate glaucoma, a condition that impacts human gait. PULLMAN, Wash. – Washington State University researchers have developed for the first time a machine-learning computer model to predict how cancer patients will fare from their treatment. The work, which also included researchers from Memorial Sloan Kettering Cancer Center, could lead to more convenient and improved methods for doctors to make cancer treatment decisions. Their study is published in this week’s issue of Journal of Geriatric Oncology. As the U.S. population ages, cancer rates are expected to increase. People who are elderly and frail often fare poorly and suffer more complications from cancer treatments like chemotherapy or surgery than people who are fit. With elderly patients, doctors use a standard questionnaire as well as an important physical test to determine fitness and to determine treatment plans. Other factors that are considered in treatment are how many medicines a patient is taking and weight loss. The physical test measures how long it takes for patients to get out of a chair, walk 10 feet, turn around and sit back down. It is an important indicator of a patient’s fitness and treatment outcomes. Patients with a slower gait speed who take more than 10 seconds to do the test have poorer outcomes than those who can move more quickly. However, doing the test is often cumbersome, for both the patient and medical staff. It requires that patients go to a clinic, which can be difficult for them. And, the results can vary, especially for slower patients. Research team includes, l-r, Marjan Nourollahi, Lucia Martisovitsova, Hassan Ghasemzadeh, Seyed Ali Rokni, Ramin Fallahzadeh. Led by Hassan Ghasemzadeh, assistant professor in the School of Electrical Engineering and Computer Science, the researchers developed an algorithm that can accurately predict which patients will do poorly on the physical test. They used data from 1,900 elderly patients who had surgery for a variety of cancers. As part of the assessment process, patients filled out questionnaires and did the physical test to determine their fitness. The researchers used input from the questionnaire to learn the most important questions in determining a patient’s fitness. Using machine learning, they were able to confidently predict 85 percent of the time how people would do on the physical test. The algorithm was able to determine that three questions in the medical questionnaire could be used to accurately predict how the patients will do. The key questions included whether the patient uses an assistive device, if they walk outside their home without limitations, and whether they can do normal housekeeping tasks. WSU computer science student Seyed Ali Rokni and Hassan Ghasemzadeh (l-r) developed an algorithm that can accurately predict which patients will do poorly on standard physical test. Based on the answers, the algorithm was able to predict the physical test. Researchers also observed that the patients’ survivability rates were highly correlated with the predicted physical test. “Our study showed that our algorithm can serve as a screening tool,” he said, adding that the actual physical test would only need to be done in 15 percent of patients. The researchers hope to do more work to validate their model and assess its impact on health care management and outcomes for older patients with cancer. The work was funded by the National Institutes of Health (Grant P30 CA008748), and the National Science Foundation (CNS-1566359 and CNS-1750679).